Former First Lady Laura Bush addressed the BSA’s national meeting on May 24 in Dallas, giving an impassioned speech about literacy, her family and the BSA’s role in shaping young lives. Mrs. Bush, who lives in Dallas with her husband, President George W. Bush, spoke at the Duty to God Breakfast in front of more than 1,000 Scouting volunteers and BSA professionals. She shared the spotlight with Scouts who had received their religious emblems and adults who were presented the National Duty to God Award. Mrs. Bush began with an update about her family. In addition to her work at the George W. Bush Institute in Dallas, Mrs. Bush is a busy grandparent. She talked about the joys of spending time with her two granddaughters, “Mila” and Poppy Louise Hager. She also shared that her daughter Jenna’s husband, Henry Hager, is an Eagle Scout. The 40-year-old earned Scouting’s highest honor on Oct. 27, 1993, as a member of Troop 444 of Richmond, Va. Throughout her time as First Lady and beyond, Mrs. Bush has worked to promote literacy in young people. The Laura Bush Foundation for America’s Libraries, which has raised $13.4 million for school libraries since its founding in 2002, is the most visible example of her legacy. She sees developing a love for reading books and magazines as more than entertainment or schoolwork. “Literacy is an essential foundation of democracy,” Mrs. Bush said. In spite of the countless young people whose lives she changed for the better, Mrs. Bush still remembers one child she wasn’t able to help and she shared this example as a reminder to Scout leaders that they matter. Their Scouting service makes a difference to every single child. 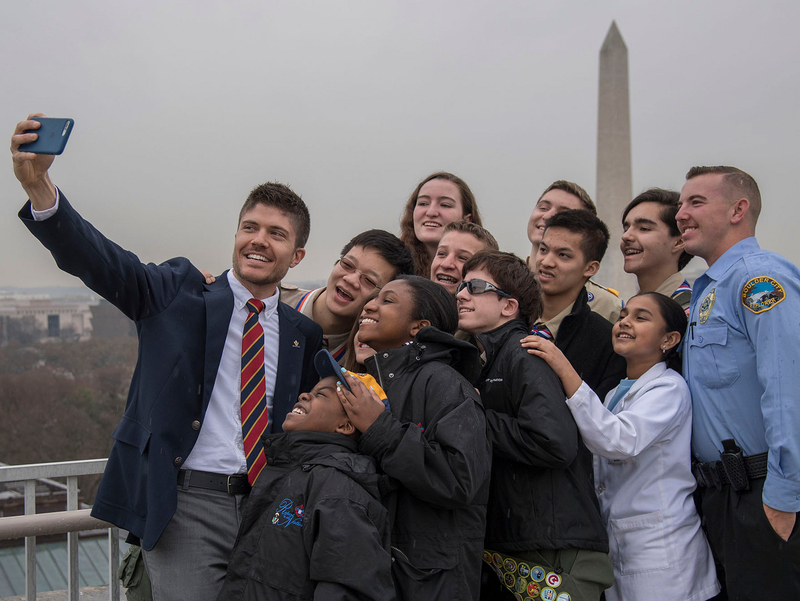 Today’s Scouts will be tomorrow’s leaders — a fact that gives adults like us an incredible responsibility.